Wisconsin Track Coaches All-State Team. Tasha Allen won the D1 100 [above], 200, and 400m dash events at the 2009 WIAA State Track And Field Meet setting State Records in the 100m [11.76, shared with Dezerea Bryant from Milwaukee Technical] and the 400m [55.19]. Note: Allen and Bryant both ran 11.76 in the prelims. 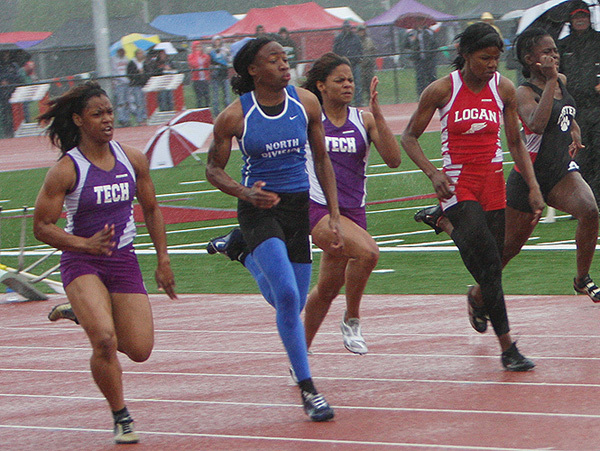 But only performances in the finals are considered for the All-State Team, The finals [above] were run in a driving rain storm. To qualify for the Wisconsin Track Coaches Association All-State Team, athletes had to finish in the top six for all three divisions combined in the finals at the state meet. Past All-State teams. 100 Meter Dash: 1. Tasha Allen (Milwaukee North), 12.05; 2. Dezerea Bryant (Milwuakee Bradley Technical), 12.18; 3. Maya Vazquez (Arcadia), 12.31; 4. Symona Gregory (Milwaukee Bradley Technical), 12.34; 5. Amber Leazer (Milwaukee Lutheran), 12.46; 6. Stephanie Henry (La Crosse Logan), 12.53. 200 Meter Dash: 1. Tasha Allen (Milwaukee North), 24.36; 2. Dezerea Bryant (Milwaukee Bradley Technical), 24.77; 3. Chidera Obasih (Brookfield Central), 24.85; 4. Gretchen Homan (Catholic Central), 25.32; 4. Maya Vazquez (Arcadia), 25.32; 6. Chelsey Simon (Whitehall), 25.43. 400 Meter Dash: 1. Lauren Unser (West Salem), 56.61; 2. Maya Vazquez (Arcadia), 56.65; 3. Alaina Murphy (Seymour), 56.98; 4. Gretchen Homan (Catholic Central), 57.16; 5. Tasha Allen (Milwaukee North), 57.22; 6. Jessica Waldvogel (Wausau West), 57.66. 800 Meter Run: 1. Katie Hill (Onalaska), 2:14.28; 2. Kelly Stewart (Amery), 2:14.36; 3. Lizzie Wendt (Germantown), 2:14.46; 4. Jamie Vandenberg (Niagara), 2:14.63; 5. Steph Stock (Green Bay Preble), 2:14.84; 6. Courtney Oldenburg (West Salem) 2:15.38. 1600 Meter Run: 1. Brea Tinney (Osceola), 5:01.69; 2. Molly Seidel (University Lake School), 5:02.52; 3. Courtney Oldenburg (West Salem), 5:02.62; 4. Kayla Wagner (Baldwin-Woodville), 5:02.75; 5. Shannon Nemetz (Denmark), 5:03.36; 6. Carli Kronstedt (Pittsville) 5:03.78. 3200 Meter Run: 1. Brea Tinney (Osceola), 10:46.51; 2. Kayla Wagner (Baldwin-Woodville), 10:46.87; 3. Molly Seidel (University Lake School), 10:49.98; 4. Kenzie Vicker (Whitefish Bay), 10:55.86; 5. Liz Berkholtz (Sun Prairie), 11:01.28, 6. Samantha Bluske (Pardeeville), 11:01.30. 5. Shelby Demos (Janesville Parker), 15.27; 6. Stephanie Zambrowicz (Ripon), 15.45. 300 Meter Hurdles: 1. Samantha Berg (Kettle Moraine), 45.30; 2. Ashley Maxon (Random Lake), 45.35; 3. Tessa Thurs (Edgar), 45.71; 4. Maya Carter (Racine Case), 45.82; 5. Katelyn Malcore (Brookfield Central), 45.97; 6. Megan Gwyn (Northland Pines), 46.04. 4x100 Meter Relay: 1. Milwaukee King , 48.68 (Shalesa Smith, Chanel Franklin, Uniqua Taylor, and Kennaye Lewis); 2. Milwaukee Bradley Technical, 48.70, (Elexis Fuller-Stewart, Sharonda York, Symona Gregory, and Derricka Wesley); 3. Hamilton, 49.66 (Molly Storm , Brooke Patterson, Ashley Holicek, and Danielle Barbian); 4. Hudson, 50.21 (Katie Thielmann, Angela Tipp, Erika Tipp , and Rachael Saathoff); 5. Milwaukee Custer, 50.24 (Shqueta Randall, Rhonda Bowers, Jennifer Luckett, and Cashay Harris); 6. Milwaukee Lutheran, 50.51 (Amber Leazer, Raynna Thompson, Alex Schad, and Chelsea Jordan). 4x200 Meter Relay: 1. Milwaukee King, 1:40.83 (Uniqua Taylor, Kennaye Lewis, Kiara Giles, and Chanel Franklin); 2. Milwaukee Bradley Technical, 1:42.14 (Derricka Wesley, Sharonda York. Symona Gregory. and Dezerea Bryant); 3. Brookfield Central, 1:45.01 (Yelena Latinovich, Kara Krugel, Sam Ott, and Chidera Obasih); 4. Arrowhead, 1:45.31 (Elizabeth Duchow, Phoebe Nygren, Ali Slater, and Heather Bong); 5. Omro, 1:45.59 ( Alyssa Baehman, Jessica Will, Jessica Berger, and Amanda Obot); 6. Catholic Memorial, 1:45.93 (Megan Nigbur, Ame Andacht, Kaitlyn Hastings, and Mara Aparnieks). 4x400 Meter Relay: 1. Milwaukee Bradley Technical, 3:59.84 (Dinah Watts, (Jasmyn Hudgins, Elexis Fuller-Stewart, and Tiffany Matthews); 2. Seymour, 4:02.05 (Justine Mehojah, Ashley Effa, Stephanie Ambrosius, and Alaina Murphy);; 3. Lake Mills, 4:02.12 (Denay Hering, Jessica Powers, Ashley Wolff, and Briana Dunkleberger); 4. Racine Case, 4:02.14 (Jatoya Woods, Jeana Frederickson, Paula Kuiper, and Maya Carter); 5. Brookfield Central, 4:02.43 (Yelena Latinovich. Hannah Trasser, Katelyn Malcore, and Erin Lueder); 6. East Troy, 4:02.61 (Brooksie Loth, Meghan Valentine, Jasmine Haines , and Tia Nowak). 4x800 Meter Relay: 1. Onalaska, 9:23.88 (Jamie Burr, Maddie Huebschman, Katie Hill, and Jami Hill); 2. Germantown, 9:29.95 (Caitlin Dillon, Mackenzie Erdmann, Andrea Sielicki, and Lizzie Wendt); 3. West Salem, 9:30.24 (Lauren Unser, Kelsey Novak, Kristin Stockheimer, and Courtney Oldenburg); 4. Arrowhead, 9:37.60 (Taylor McDowell, Gabrielle Levac, Amanda Bauer, and Andie Zeman); 5. La Crosse Central, 9:38.38 (Megan Baumler, Ashley Hammes, Azjja Kjos, and Abby Knutson); 6. Waukesha West, 9:38.62 (Allie Joost, Felicia Gesior, Nicole Martens, and Mallory Schmidt). High Jump: 1. Rachel Melum (Iola-Scandinavia), 5-09, 2. Shelby Demos (Janesville Parker) 5-06, 2. Lindsay Wiebe (Ashland) 5-06, 4. Kayla Ashland (Bloomer), 5-05, 5. Elizabeth Axell (Wrightstown), 5-04; 5. Jenna Breaker (Tigerton), 5-04; 5. Katie Langmeier (Cuba City), 5-04. Pole Vault: 1. Danielle Vetesnik (Richland Center), 11-06, 2. Melissa Flucke (Ashwaubenon), 11-03, 3. Jessica Martell (Osceola),11-00, 3. Leanna Rose (D.C. Everest), 11-00, 5. Brianna Baeten (Ashwaubenon), 10-09; 5. Hannah Wallace (Whitefish Bay), 10-09; 5. Stefanie Weber (Burlington (10-09. Long Jump: 1. Aileen Lemanski (Florence), 18-06.5; 2. Maya Vazquez (Arcadia), 18-04.75; 3. Carlye Schuh (Xavier), 18-04; 4. Jessica Waldvogel (Wausau West), 18-01.5; 5. Brooke Hinstorff (Lakeside), 17-09.75, 5. Emily Worden (La Crosse Logan) 17-09.75. Triple Jump: 1. Shalesa Smith (Milwaukee King) 38-06.5; 2. Shavanna Talbert (Fond du Lac), 37-10; 3. Emily Haines (Tomah), 37-05.5; 4. Samia Taylor (Madison La Follette), 37-05; 5. Katelyn Malcore (Brookfield Central), 37-04.25; 5. Erika Suchla (Arcadia), 37-00.5. Shot Put: 1. Angela Boushea (Monona Grove), 44-08.75, 1. Mary Theisen (Regis), 44-08.75; 3. Jessica Maroszek (Seymour) 44-03; 4. Jecel Gerner (Markesan), 44-00.5; 5. Sam Steinbring (Slinger), 40-11.75; 6. Hannah Turnbull (Hayward) 40-09. Discus Throw: 1. Jessica Maroszek (Seymour), 139-05; 2. Alissa Rausch, (Wausau West), 132-04; 3. Caitie McPherson, (Watertown), 127-10; 4. Jecel Gerner (Markesan), 127-07; 4. Mary Theisen (Eau Claire Regis), 127-07; 6. Breanna Strupp (Slinger), 125-10.